Issue 3 included a cover story about some Irish republicans being arrested in Hackney, extradited to Belfast for interrogation and then returned to London where they were charged with possession of arms and ammunition. After the four had been in prison on remand for eight months, the charges were dropped as it turned out they had been fitted up by a special branch spy cop. A one page article on the the beginning of the trial of the Stoke Newington 8. Apparently there were 137 other “Angry Brigade” suspects. A report back from a meeting of “between two and three hundred women… at the London College of Furniture in Commercial Street in Stepney”. Topics included wages for housework, campaigns to get better wages for cleaners, abortion, contraception, housing struggles. “If he dies it will save us the expense” – apparently the words used by social security staff in response to a campaign to get a 74 year old man some essentials like a dressing gown in readiness for a hospital visit. You can read the full text of the article above. Kick The Bastards Out – on dole snoopers. Black Tenants Fight Back – on racist attacks against black families on Haggerston Estate, and a call for white tenants to show solidarity. 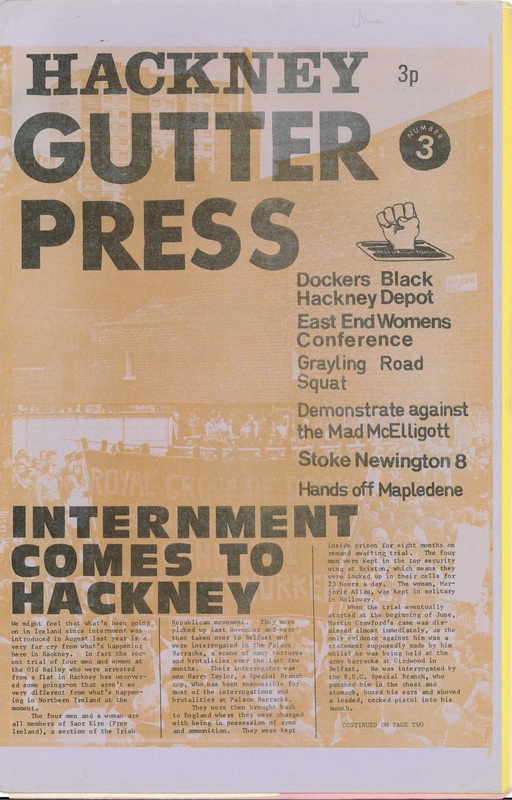 Dockers and Containers – on the dockers’ strike and continuing picket of the Midland Cold Storage co, Waterden Lane (Hackney Wick, now slap bang in the Olympic Park). 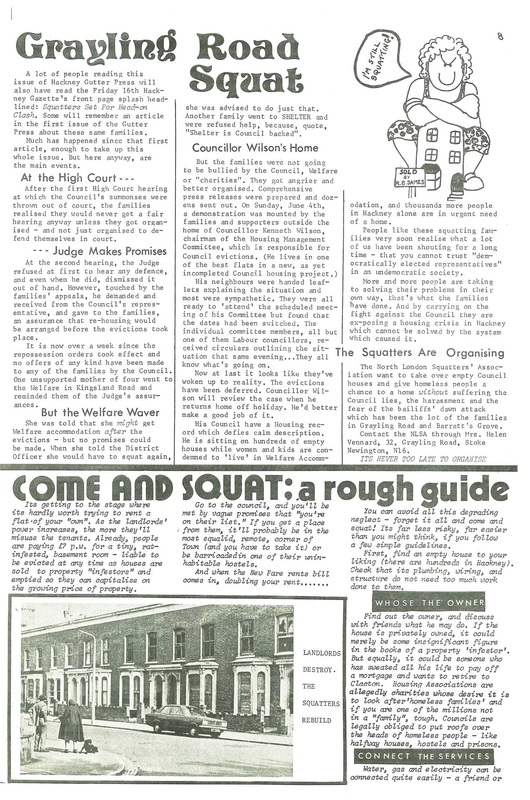 Also poems, details of folk clubs, letters (including one of the Grosvenor Avenue arrestees referred to in the previous issue, who got a one year suspended sentence), small ads, an appeal for more people to get involved with laying out and distributing the paper. 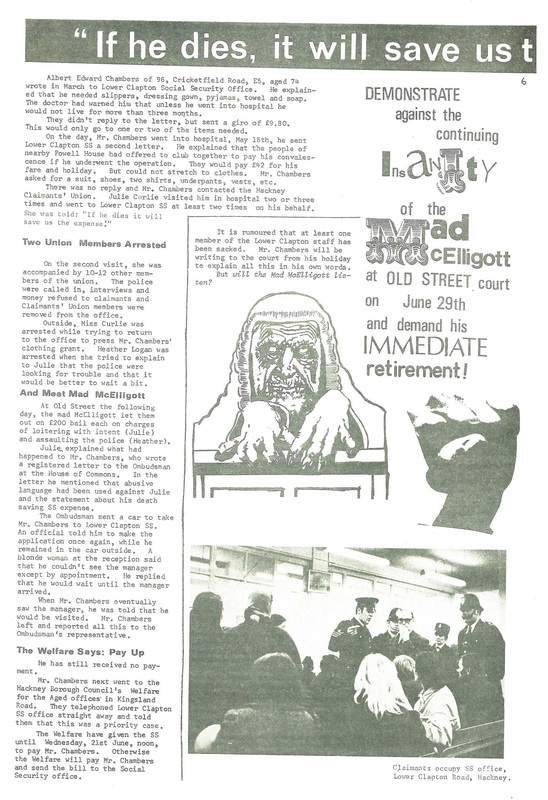 This entry was posted in 1970s, Angry Brigade, feminism, Hackney Gutter Press, Hackney Wick, housing/squatting, Ireland / Irish, police, racism / fascism, uncategorized, unions by ackneyinnit. Bookmark the permalink.